"Ein is on a mission from God. A God of Death. Ein has four legendary heroes in mind, names from story books read to him by his father. Now he must find them and kill them, so he can bring them back to fight the Reaper's war." Never Die is a story with a premise quite unlike anything else I've read. It starts out with a young boy named Ein who basically picks out four of the best warrior heroes to bring back from death to help him with a much larger overarching goal. That's not something you read everyday, but I almost wish I could because it was highly entertaining and inventive. This is a shorter book, coming in at a little under 300 pages--definitely the shorter side for fantasy--but it didn't lack in content, world-building, or interesting characters in the slightest. I've only read one other book by Hayes so far (something that I hope to rectify this year! ), but I felt that this was even better than the other that I've read and will have a much broader appeal to more people. The East Asian setting in particular was something that I really enjoyed, as it was one that felt vivid and fresh and I'm always looking for more non-Western fantasy. As much as I enjoyed the setting, it's really the characters that make this book shine as much as it does. These are warriors who prove their power and might regularly through dueling, a concept that really sets the tone for much of the rest of the plot. I usually comment on a few particular characters in my reviews, but I couldn't decide on just a few to remark upon and I also think part of my enjoyment with this book was learning about each character as I went, so I've decided to not individually mention any. As far as personalities go, Hayes did a great job of developing a wide variety of character types, some of which get along and some that absolutely do not. Each character also tended to have a particular fighting skill that they excelled in, which was usually what they, as warriors, were most known for and that I loved seeing in action. That felt like a very classic element to add to the story and I learning about that with each character. One of the things I'd most like to praise about Never Die is the pacing. It's not as though there's constant action in this story, but there's always something interesting going on. There is still plenty of action, but it's balanced really well with other events that make this a truly satisfying read that I had no problems getting through. There is also plenty of humor peppered throughout the story, though it's balanced well with more serious discussion and events as well, which again helped the book to feel balanced in all areas. The only potential issue I had was simply that I would have liked to see the world developed a bit more. It was developed well enough that I could understand and become somewhat immersed in the world, but it just didn't feel quite as detailed or expansive as it could have been. There were a few times when it felt as though it were on a larger scale without as much detail. That's a minor quibble, though, so it didn't impact my overall enjoyment much. 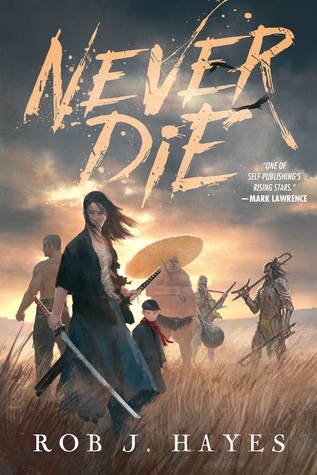 Overall, I've given Never Die four stars! If you've not read anything by Rob J. Hayes before, I really think you can't go wrong with this great fantasy. I've been seeing this book around a lot, glad to hear it was a really good read for you. I do love that cover!